Adding to a growing collection of books dealing with religion and war in American history, Matthew McCullough's The Cross of War (University of Wisconsin Press, 2014) takes on the "splendid little war" of 1898. Fellow RiAH blogger Mark Edwards was apparently as interested in this new book as I was, since we independently made plans to feature it in our August posts. My post below is not necessarily a thorough review, but it will offer some initial reflections and a summary of the way McCullough framed the book. In a few days, Edwards will allow McCullough to speak for himself about the project (and/or refute everything I've written here). McCullough's book is based on a dissertation written under the advisement of James Byrd at Vanderbilt. McCullough and the editors at UW Press seem to have done a bang-up job in the transition from dissertation to book. From intro to conclusion, this is a slim, sleek, and well-written 141 pages (much of the material cut must have found its way into the endnotes, which clock in at 40 pages). Also, shout-out to whoever made the decision to put a Puck Magazine cartoon on the book cover. 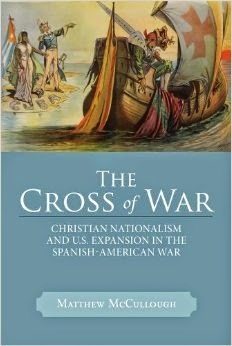 McCullough describes his book as a study of Christian nationalism, or the view that America is a "central actor in the world-historical purposes of the Christian God" (he draws on scholars like Ernest Tuveson, Conrad Cherry, Liah Greenfield, and Harry Stout for his discussion of civil religion/Christian nationalism). Recognizing that Christian nationalism in America has taken various forms over its history, McCullough primarily focuses on "messianic interventionism," a term he chose became "it captures the prevailing sense that America could intervene in the affairs of other nations not to advance America's national interests but on behalf of the weak." While messianic interventionism had various precedents before 1898 and became especially prevalent during World War I, McCullough argues that its "emergence and codification" was a direct result of the events and context of the Spanish-American War. Most readers will likely already be familiar with the basic contours of the messianic interventionism described by McCullough, as other scholars have previously discussed the rhetoric of Christian duty and humanitarianism that was used to justify U.S. involvement in Cuba and overseas expansion. Some scholars interpret this supposed humanitarianism as nothing more than a mask for more sinister and exploitative motives. McCullough rejects that view. He believes that, at least in the case of the Christian leaders he studies (and President McKinley), the benevolent motives were sincerely held -- and yet, just as destructive and "deeply misguided." So if the association of messianic interventionism and the Spanish-American War is not a new concept, what is McCullough's book bringing to the table? To get at this, it is appropriate to bring in a book that covers similar ground: Paul McCartney's Power and Progress: American National Identity, the War of 1898, and the Rise of American Imperialism (LSU Press, 2006). In that book, McCartney documents the dominant sense of American national identity in the 1890s (including its strong Christian/humanitarian features), and argues that national leaders made foreign policy decisions in 1898-99 based upon that guiding framework. A book review that McCullough wrote for Fides et Historia in 2009 basically explains the gaps in McCartney's book that The Cross of War attempts to fill. In that review, after an overall positive assessment of Power and Progress, McCullough noted that it suffered from two maladies: first, "the war itself receives very little attention, leaving unanswered questions about how perspectives adapted in response to the specific events of the war." And second, there was a "lack of attention to the perspectives of religious communities and religious leaders during the war." It is in those two areas where The Cross of War claims new ground. McCullough views his task as primarily descriptive, an explanation of the "content of an ideology" as it developed among the mostly white Protestant clergy in response to the events of 1898. Relying on sermons and the religious periodical press, McCullough's study stretches across regional and denominational lines (with the West, in my view, getting short shrift) to get a sense of the full scope of messianic interventionism as it was articulated by Christian leaders. The eight denominational bodies included -- Methodists, Baptists, Presbyterians, Lutherans, Disciples of Christ, Episcopalians, Congregationalists, Roman Catholics -- made up about 80 percent of American church membership in the 1890s. On occasion, McCullough also includes African American (primarily AME) ministers in his analysis. McCullough makes a strong case that Christian ministers -- whether Protestant or Catholic -- articulated similar views of America's place in the world during the war. Furthermore, by tracking the reaction of ministers to specific events (he focuses on events from February 1898 until the end of the year), he is able to explain the subtle changes in their rhetoric that occurred over the span of the war and its immediate aftermath. As he puts it, Christian ministers first explained why America should go to war with Spain, then why America could get involved in the affairs of other countries without falling prey to greed and selfishness, and finally why America would succeed in their newfound interventionist foreign policy. As clergymen articulated their sense of America's new place in the world, notions of providentialism and humanitarianism were indispensable. I suspect that some criticism of the book will come not from what McCullough includes, but from what is left out. What of the variant Christian nationalisms present in 1898? What about those Christians opposed to the war or to the post-war occupation of Spain's former colonies? What about women? What about African Americans? What about precursors to overseas expansion, like American expansion into Mexican and Native American lands? What about the importance of missionaries in fostering an international/interventionist orientation? McCullough addresses all those issues (and other potential critiques), particularly in the introduction and endnotes. Whether or not he addresses them to the satisfaction of all readers is another matter. But as he writes, "[m]ine is primarily a study of the ideas propagated by elite shapers of public opinions" -- and elite shapers in 1898 were usually white, Protestant men. As for his focus on Christian ministers, he argues that "the ideological groundwork for messianic interventionism appears most clearly" in their rhetoric. McCullough has good reason for focusing on the Christian clergy. Andrew Preston, for one, notes in The Sword of Spirit, The Shield of Faith that "religious groups led the way in both justifying American intervention on moral grounds and rallying Americans to the cause" in 1898. Furthermore, in the 1890s Christian ministers still had a prominent national role in explaining and interpreting current events and helping to shape public opinion. Religious periodicals and Christian publishers dispensed ministers' editorials and sermons to a wide audience. Most daily newspapers regularly printed sermons from local ministers, giving them access to an audience beyond their own congregations. Newspaper editors also solicited and printed the opinions of ministers on various current events. At a time when the the rise of the professionalized "expert" intellectual class was just underway, many pastors acted as pundits and public intellectuals of a sort. Yet at the same time, the meaning of Christianity in the 1890s was increasingly being contested outside the walls of the church. From some members of the Populist or labor movements, for example, church leaders came under fire for their inability to represent the "true spirit" of Christianity. During the war in 1898, those debates were not as apparent -- but, as Michael Graziano recently reminded us, war time is different. Since McCullough's study is almost entirely focused on events during a ten-month span in 1898, the battles waged in the war's aftermath over the proper Christian approach to imperialism are mostly glossed over (he does briefly mention them in the conclusion). The limited chronological scope of McCullough's study is thus a blessing and a curse. On the one hand, his zeroed-in focus has the the benefit of allowing for a deep, thorough reading of the rhetoric of Christian clergymen during the events of 1898. It also helps to highlight historical contingency: McCullough makes a strong case that the specific events of the war were indispensable to the way messianic interventionism developed and was articulated. But, such a close reading naturally opens up the door to criticism that he does not adequately emphasize messianic interventionism's pre-1898 forerunners or its contested development in the war's aftermath. Those potential critiques aside, it seems to me that McCullough accomplished what he set out to do. His concise and eloquent book provides a detailed analysis of the way Christian ministers interpreted the events of the Spanish-American War, and a thorough description of their articulation of the ideology of messianic interventionism. This also strikes me as the sort of book that some non-specialists (in particular, Christian pastors) could pick up and enjoy. Speaking of the clergy, McCullough himself is presently a pastor. Obviously the public role of the pastor has changed much over the past century. But I wonder if McCullough's research of 1890s Christian ministers has in any way influenced how he views his own responsibilities. It would be interesting to hear if it has caused him to reflect on his public pastoral role, both in relation to his various publics (congregants, readers, etc) and to the American state.